This is a revolutionary self-coaching handbook will really help you to reflect on your life and see what steps you can take to improve it. I, Pia Webb, will personally guide and inspire you through-out. 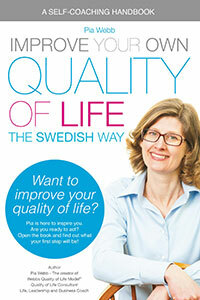 It´s easy to improve your own quality of life. You might ask yourself, how long will it take? Once you take that first step in the right direction you will feel an instant improvement. Read more about my book here!